Planned donation is the largest in the history of Houston’s park system; ensures the Bayou Greenways 2020 project connects communities, spurs economic development and leaves a lasting impact on the City of Houston. Rich and Nancy Kinder, through their family foundation, have announced plans to donate $50 million to the non-profit Houston Parks Board for the Bayou Greenways 2020 project, which would make it the largest donation in the history of Houston’s park system and one of the largest grants to a public greenspace in the United States. 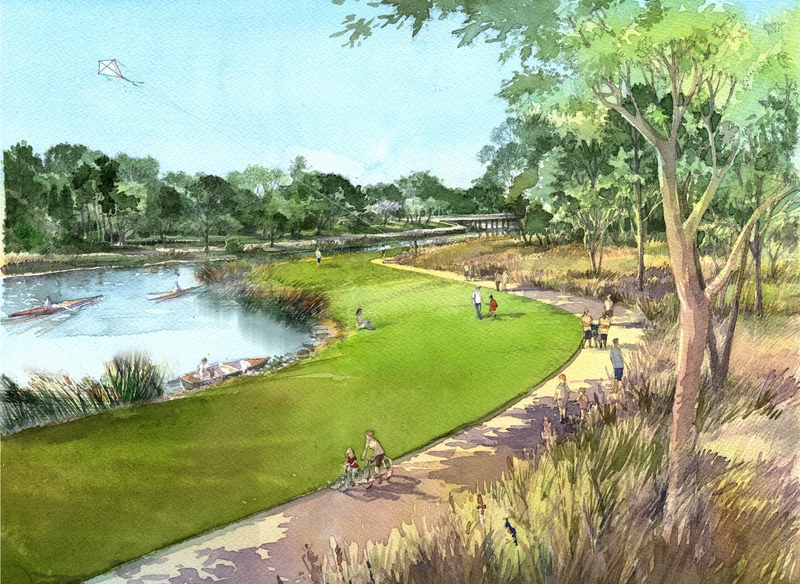 The Kinder Foundation was inspired by the visionary project to create new parkland and trails to connect greenspaces along Houston’s bayous. The creation of parkland, trails and natural areas along major bayous – while enhancing protecting and preserving water quality, natural habitat, and native wildlife – promotes the overall health and welfare of the city. Once Bayou Greenways 2020 is complete, Houston will have the largest off-street shared use path system in the nation. The seven-year Bayou Greenways 2020 project will be funded through a public-private partnership. In November 2012, voters approved a bond referendum allowing the City of Houston to fund $100 million to complete the Project. The Houston Parks Board has committed to raising a matching $115 million. To date, $21 million has been committed with significant gifts by Houston Endowment Inc., The Wortham Foundation, Inc., The Fondren Foundation, the Brown Foundation, multiple federal agencies and individual donors. The Bayou Greenways 2020 Project will create 1,500 acres of new and equitably-distributed parkland within the City of Houston and ultimately connect 150 miles of trails (80 new miles connected to 70 existing miles of trails) along nine Houston bayous including White Oak, Brays, Sims, Hunting, Halls, Greens and Buffalo bayous, as well as Cypress and Clear Creek. The Houston Parks Board is managing the private fundraising, design and construction. In addition, the organization will be responsible for maintaining approximately 4,000 acres of existing and new parklands in the completed Bayou Greenways 2020 project. Upon completion, it is estimated that 6 out of 10 Houstonians will live within a mile and half of a bayou park or trail. Project segments along the bayous will be announced in phases and will be complete by 2020 creating ample opportunities for neighborhoods and communities to connect and explore both the existing trails and the new ones to come. Overall the project is projected to generate $70 million annually in benefits which includes $10 million in economic health benefits (enhanced property values and company talent relocation and retention); another $10 million in environmental health benefits (flood/runoff reduction and enhanced water quality); and, finally, $50 million in physical and mental health benefits (recreation use value). The Kinder Foundation is a family foundation established by Rich and Nancy Kinder. It is the mission of the Foundation to enrich the lives of people in the Houston area through transformational grants that impact greenspace, education, and quality of life. In recent years, the Foundation has invested both, financially and personally, in the success of two of Houston’s most vibrant greenspaces, Buffalo Bayou and Discovery Green; in the Museum of Fine Arts, Houston; in Rice University’s Kinder Institute for Urban Research; and in the Archdiocese of Galveston-Houston, among others. To date, the Foundation has as granted over $100 million in gifts and pledges. For more information, visit http://www.kinderfoundation.org. The Houston Parks Board, a 501 (c) (3) non-profit organization, whose mission is to create, improve, protect and advocate for parkland in the Greater Houston region. Since its inception in 1976, the organization has raised and leveraged millions of dollars and touched at least 75% of the City’s parkland either through acquisitions and/or capital improvements. The Houston Parks Board will lead the private fundraising of $115 million and manage acquisition, design and construction of the Bayou Greenways 2020 Project over the next seven years. For more information, visit http://www.houstonparksboard.org.